"...Dis is my lucky stake. I have killed many vampires with it. I call it Mr. Pointy." The favorite weapon of the Vampire Hunter, and frequently the only thing capable of finishing them off for good. Because weirdly enough, only wood can kill a vampire, whereas sword impalement (short of beheading) cannot. This may be because the wooden stake was a once living plant, much like the vampire was a once living human, unlike the sword which was never alive. Yes, this occasionally means that someone can be killed via pencil to the heart, or that a bow and arrow can be more effective than a gun. 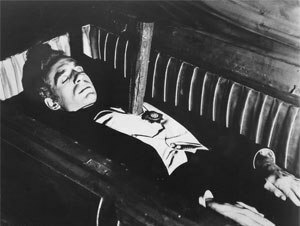 In early vampire fiction, stakes were simply used to pin a "vampire" into its coffin while it slept, keeping it from waking back up and causing trouble. It was also a lot harder to get the stake in than it is in modern fiction — you had to hammer the stake in with a mallet or a gravedigger's shovel to get through the vampire's ribcage. When it became a bizarre all-purpose vampire-killing weapon is unclear. In My Monster Secret, most of the traditional vampire weaknesses are Played for Laughs, even with a full-blooded vampire like Youko's father Genjirou. It's even suggested that a wooden stake to the heart isn't fatal, since Genjirou's wife Touko has brandished a stake and mallet in order to make him calm down and stop harassing Asahi. It's mentioned in Karin that this will kill a vampire, though it doesn't really qualify as a weakness since "A stake through the heart would kill anybody!" Hyo from Ushio and Tora finally kills for good a classical Vampire by ramming a massive wooden stake in his chest while he was lunging at him. This proves the only way to kill him for real. In Shiki, a stake to the heart is one of the preferred methods in dealing with the many vampires running around. It does however not need to be a wooden stake, any kind of stake will do as long as it pierces the heart and keeps it from repairing itself in a timely fashion. Magic: The Gathering include the Wooden Stake card, which is an artifact that destroy vampires automatically. Batman Vampire: The traditional method of killing vampires is via stabbing (and thus immobilizing) them with wooden stakes, followed by beheading to kill them permanently. Batman winds up killing Dracula via impaling him on a splintered utility pole (and then he's hit by lightning, dusting him), and utilizes special wooden throwing knives against his vampire enemies. Later, Batman himself is immobilized with a wooden stake, leaving him in a dormant state of And I Must Scream until it's removed. Unfortunately, by that point he's been driven quite mad and goes on a killing spree. In Buffy the Vampire Slayer/Supergirl crossover The Vampire of Steel, Supergirl, Buffy and the Gang face a Kryptonian vampire. Regular wooden stakes can't pierce his skin, not even being magically-enhanced. Kara gets stakes carved of Kandorian trees since anything from Krypton becomes indestructible on Earth. In Vampyr, the titular vampire is weak not to the traditional wooden stake, but to an iron one. In Van Helsinki, the eponymous character as well as Van and Fay Løren carry these. Van uses his on his Arch-Nemesis the vampire Geoff, to fatal effect. Lifeforce: Played with. The space vampires are vulnerable to iron stakes, and they have to be stabbed a few inches below the heart to actually kill them. Fright Night 2: New Blood: One of the vampire weaknesses, but it's not as easy as it looks. When Peter tries to kill Gerri with a stake, he misses her heart by several inches. Gerri: [after Licking the Blade] ...missed! Dracula Ad 1972 opens with Lawrence van Helsing's 1872 confrontation with Dracula, which ends with a carriage crash that leaves a shattered wheel lodged through Dracula's chest. After a bit more struggling, Dracula turns into a skeleton with one broken-off spoke sticking out of its chest. Dr. Terror's House of Horrors: In the "Vampire" segment, Dr. Blake convinces Dr. Caroll that his wife is a vampire, and that the only way to kill her is to drive a stake through her heart. Dr. Caroll does so. Afterwards, the police arrive and arrest him for murder. He screams for Dr. Blake to back up his story, but Blake denies any knowledge of what he is talking about. After the police drag Caroll away, Blake turns into a bat, announcing that this town isn't big enough for two doctors, or two vampires. The Vampire Diaries: This is one of the weakness of the protagonist, Stefan Salvatore. If he's wounded by wood it will cause the vampire to become severely weak. However, if a wooden stake is penetrated through Stefan's heart, it will result in instant death. In The Gardella Vampire Chronicles, Victoria hides her wooden stake in her hair when she goes to fancy events. Weird Tales: Averted in "The Man Who Cast No Shadow" by Seabury Quinn. On the other hand, "Restless Souls" goes with more traditional vampirism (must be invited in, fears holy relics, etc.). Masquerade of the Red Death: Dire McCann crosses this trope with Improbable Aiming Skills. One of his special anti-vampire weapons is a set of sharp, thin wooden rods. He immobilizes several vampires by throwing one of those rods into the vamp's heart. note OK, there is a metal core in them so they don't just break when used, but the fact that he can stake vampires with a thrown weapon is a bit of a stretch. Bunnicula: In book 1, Chester reads that one way to dispose of a vampire is to pound a sharp stake through their heart. Fortunately for Bunnicula, the cat misunderstands and winds up trying to pound a sirloin steak through his heart instead (and Harold offers to taste it and see if it's sharp). Later, in book 3, Chester and the dogs use toothpicks and twigs to impale the vegetables that Bunnicula had drained during his nightly wanderings. The weapon of choice on Buffy the Vampire Slayer. Kendra had a favourite stake she dubbed "Mr Pointy". Buffy "adopted' Mr Pointy after Kendra was killed. Ultraviolet: Vampires are particularly susceptible to wounds inflicted with pointy bits of wood, which messes with their healing factor somehow. The team has moved on from stakes, however, and use guns loaded with carbon-compound "dum-dum" bullets — though one still needs to aim for the heart. Vaughn also has, as his personal signature weapon, a device like a spring-loaded ice-pick with a spike made from the same compound. Forever Knight had this as one of the ways a vampire could be killed. In addition, the Enforcers (the vampire "Secret Police") carry guns with wooden bullets. Highlander had an episode called "The Vampire" which dealt with an Immortal who killed mortal victims by making it look like a vampire did it (his walking stick was essentially a giant double-pronged syringe with which he would siphon their blood out). A Vampire Hunter shows up and hammers a wooden stake through his heart. The Immortal then got up and killed him. Sliders had an episode where the gang come to a world where vampires are real. The Vampire Hunter who appears in the episode (played by Tommy Chong) had a crossbow that fired wooden stakes. He said staking a vampire through the heart frees their soul, allowing them to die. The pagan gods can be killed with evergreen stakes. A Trickster like Loki can be killed if impaled with a wooden stake. An angel, however, cannot. When vampires in True Blood are staked, they dissolve in a puddle of blood. Moonlight stays true to the original version: stakes to the heart only immobilize rather than kill. Discussed in an episode of British horror anthology Urban Gothic by vampire Rex. "Stake through the heart? I don't know anyone that wouldn't kill." Truer to form, a wooden stake through the heart won't destroy a vampire, but it will turn it into an immobile corpse and makes destruction of the body easy, usually by cutting of the head and filling it with holy wafers. Don't expect this to work during a fight, however; at best it can be done if you catch the vampire resting in its coffin. Ravenloft added several vampire variants with their own stats in 2nd edition, including elf vampires, dwarf vampires, halfling vampires, etc. The wooden stake vulnerability was often changed to something else for each of them; for example, a dwarf vampire wouldn't be stopped by wood, but by a naturally formed stalactite through the heart. Telluric Vampires have several similarities to supernatural ones, but also have some important differences. Notably, wooden stakes have no effect, but stakes made from conductive materials ground out a vampire's telluric energies and paralyze it. That said, Edom is prepared for a GM who is using the default vampire build instead. The agency's standard-issue crossbow is designed to fire heavier-than-normal wooden quarrels, which can stake a vampire with a really good shot. They also provide a Stake Tube for those times when a vampire is caught sleeping in its coffin; instead of several hammer blows, a pneumatic piston drives the stake into place with a single shot. Vampire: The Requiem: Piercing a vampire's heart with wood forces it into a comatose state of "torpor" for as long as the wood is there. This tends to be very unpleasant for the vampire, akin to being trapped in a violent nightmare. To work, a single piece of wood needs to go completely through the heart — shotgun shells filled with toothpicks are explicitly disallowed. Vampire: The Masquerade  Redemption: Available as a weapon, it works like a dagger, deals pitiful damage but has a chance of impaling a vampire enemy in the heart, rendering him helpless for a while as you whale on him. Oddly enough, the same effect can be achieved with arrows and bolts (though it's rarer). Finally, the modern age brings up the a Stake Gun, which is a stake-shooting gun. In Town of Salem, this is the Weapon of Choice of the Vampire Hunters (at least until all the Vampire are dead and they pick up a gun). A cross-shaped stake is featured in their avatar, and they use it to kill vampires in their kill messages. An inversion in Timeslaughter, where it is Vlad the Impaler himself who uses a wooden stake in his Slaughter Move. In Terraria, the stake launcher fires, guess what. As one might expect, it has a huge damage bonus against vampires. Metaspace: The Mage Hunter Mooks can fire wooden stakes at high speed. Burning ones. In Infamous 2, after losing his Amp, Cole makes a makeshift wooden stake out of a large cross with a pointy bit of wood on the end from a broken coffin lid. Castlevania: Lords of Shadow: A stake extension is one of the upgrades of Gabriel Belmont's Swiss Army Weapon, the Combat Cross. It is used both as a weapon to kill vampires, and as a tool to get extra leverage for operating broken portcullis winches. In Castlevania II: Simon's Quest, Simon needs to toss oak stakes at the orbs hidden at the end of each dungeon to retrieve Dracula's body parts. In Baldur's Gate II, following D&D rules, vampires need to be staked in their coffins after being defeated. Consequently, wooden stakes are an item you need to find/carry. In RuneScape, one quest involves using a stake to slay a weakened vampire. Somewhat notable in that the player needs to use a stake hammer to drive it in. Another version shows up in the vampyre quests from "The Branches of Darkmeyer" on. In this case, the stakes must be made of blisterwood, a rare tree that vampyres are deathly allergic to. Nearly nothing else can even injure them, but somehow throwing blisterwood stakes (or shooting them from a modified crossbow) works. A possible way for Lucy to deal with the titular vampire in 16 Ways to Kill a Vampire at Mcdonalds. Maggie, one of the her teammates, is said to use one alongside a machete as her primary means of killing vampires. The traditional vampires in Charby the Vampirate can be killed this way which is why Victor carries a bow and a quiver of arrows. "Pureblood" vampires appear to have an additional weakness to silver and both can be taken out by decapitation or a well placed messy shot to the head. As it takes place in the same city as Charby Here There Be Monsters vampires can presumably be killed by a stake through the heart but have thus far only been seen killed via headshots and decapitation. Zig-zagged in Sluggy Freelance. Weaker vampires will croak from a stake. Stronger ones like those of the Lysinda clan can be withered and left immobile and powerless, but it can't kill them. 454. No staking a vampire with anything larger than his chest cavity. 1851. Can't use woodchippers as shotguns against vampires.